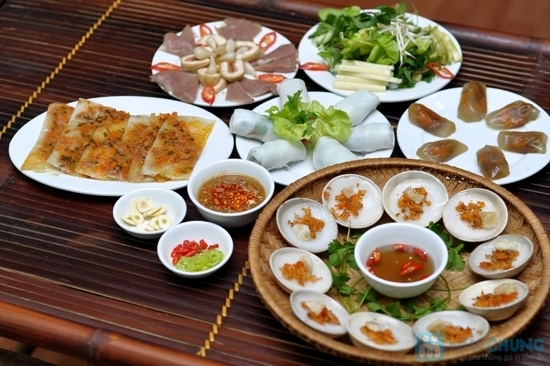 There are a lot of delicious dishes in central Vietnam, but the most popular specialties are beef noodle soup, grilled spring rolls and rice paper cake wrapped with pork meat. Now tourists can taste these dishes in Hanoi. The dish originated from Quang Nam province but gradually became popular and typical for the central area of Vietnam. Compared to other noodles, and noodle soups, of Northern people, Quang noodles have its own feature. It is not fully watered; just mix materials to absorb spices. The dish is not only tasty, but also eye-catching with red shrimp, white pork meat, yellow egg and green fruits and vegetables. It is served with roasted rice crackers or roasted peanuts. You can find this dish on the streets of Quang Trung, Nguyen Hong, and Ngoc Khanh. You just need simple materials such as: pork meat, rice paper cake, raw vegetables. Da Nang people created a dish hard to resist. It presents in Hanoi with little variation but typical flavor remains unchanged. 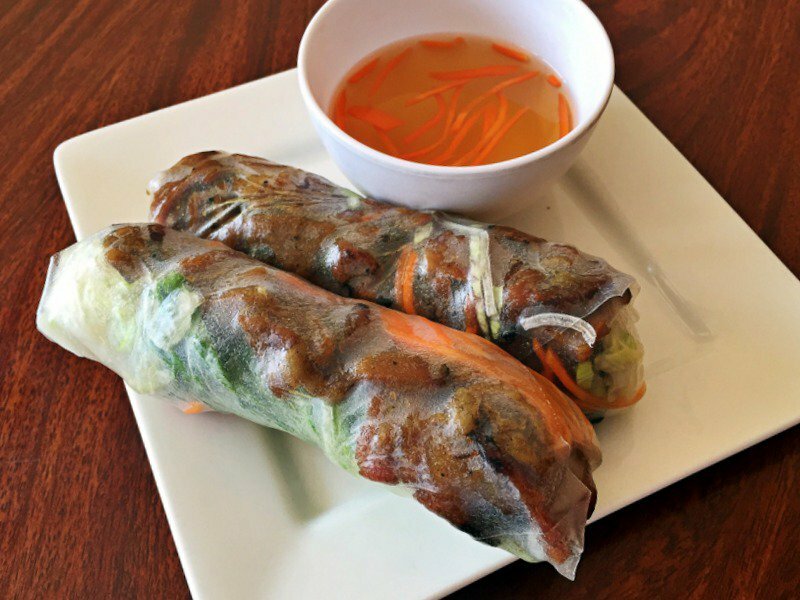 You can choose boiled pork meat or fried meat to wrap with raw vegetables, pineapple, carrot, and sliced cucumber, then coat with rice paper cake. 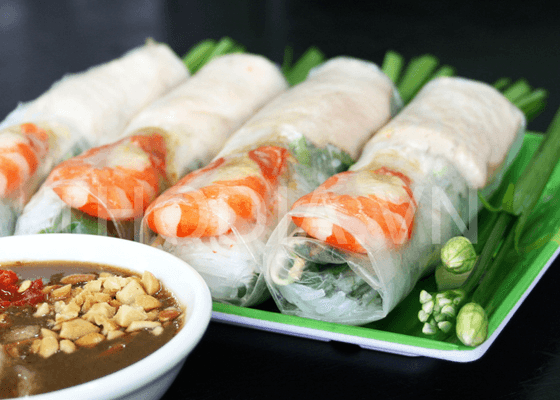 Dip in its sauce, and you will feel the sweetness of meat, coolness of vegetables, softness of rice paper cake together with typical fragrance of dipping sauce. In Hanoi, you can find this dish on Pham Ngoc Thach Street, Truc Khe Street, Duy Ta Street, etc. 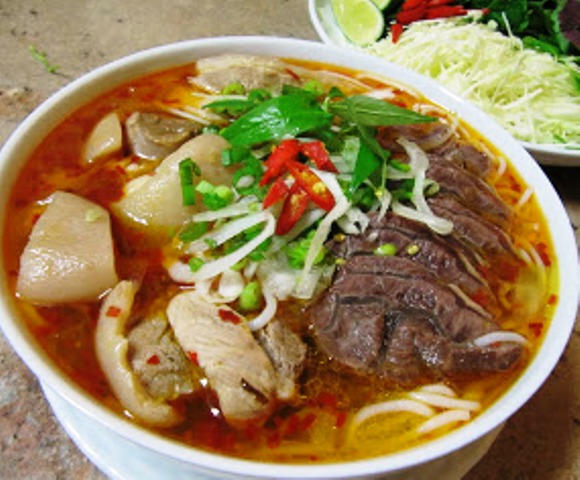 Compared to other dishes of the central region in Hanoi, Hue beef noodle soup is the most popular. Diners can choose the dish for any meal in day including for breakfast, lunch, and dinner. Apart from round long white noodles, a right Hue beef noodle soup must have porsaan potka, thin slices of beef, thin slices of boiled blood, and a slice of pork roll. However, the difference of Hue beef noodle soup from Hanoi noodle is spicy and sweet broth. In Hanoi, it is easy to find the dish along Nguyen Thuong Hien Street, To Hieu Street, Kham Thien Street, etc. Unlike spring rolls or fried fermented spring rolls, the grilled minced pork rolls are made of minced pork meat mixed with pork skin, then marinated with salt, pepper, sugar, roasted rice powder and then wrapped around lemongrass stalks or bamboo sticks, grilled on charcoal fire. It is served with raw vegetables, bean sprouts, green banana and dipped with broth. You can find this dish on the streets of Thuy Khue, Doi Can, Phan Huy Ich or Kim Lien market. Hue cakes include tapioca cake, pancakes, steamed shrimp rice cake, bloating fern-shaped cake, etc. Hue restaurants in Hanoi for your reference are located on Lang Ha Street, Hang Bong, and Thai Thinh.